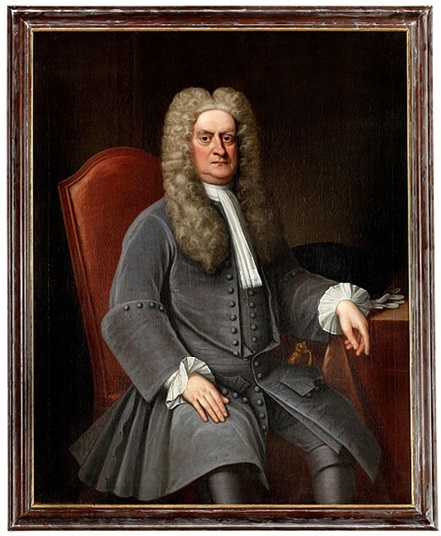 The roots of the color wheel came from the mid-1600s when Sir Isaac Newton was experimenting with optics. He was working with white light, which led him to the discovery of light’s visible spectrum when he observed how each color of light would bend while passing through a prism. While doing his experiments, he formed the theory that red, yellow and blue were primary colors, meaning that all the other colors were derived from the combination of the three colors. Although it was discovered later that his theory was not altogether true, it was very influential in the development of the color wheels in the early part of the 1800s and the color wheel that people use today. Mixing the three primary colors resulted in the creation of secondary colors, which are green, orange and violet. The tertiary colors created were yellow orange, red orange, red purple, blue purple, blue green and yellow green. The primary, secondary and tertiary colors make up the color wheel. This has been the basis of an artist’s color palette for centuries. Sir Isaac Newton invented the first color wheel in 1706, when he played around with a with a rotating disk wherein he arranged red, orange, yellow, green, blue, indigo and violet (ROY-G-BIV), which also represent the colors of the rainbow. When he spun the disk, the colors blurred together in a speed so fast that only white was seen by the human eyes. Joining the ends of the color spectrum, Newton was able to show the colors’ natural progression. During his time, Newton associated each color with a musical note. At first Newton did not believe that light, which travels in a wave, is made up of several waves, each of which is made up of a single color. At that time, the accepted theory was that colors were formed from the blending of dark and light. When he experimented with optics, he placed a prism in a dark room and shone a thin beam of light on it. The white light that passed through the prism broke into separate color waves, thus proving the theory that many colors make up white light. He then made a color wheel, with the colors dividing the wheel into seven parts. When spun rapidly, the colors appeared as white. 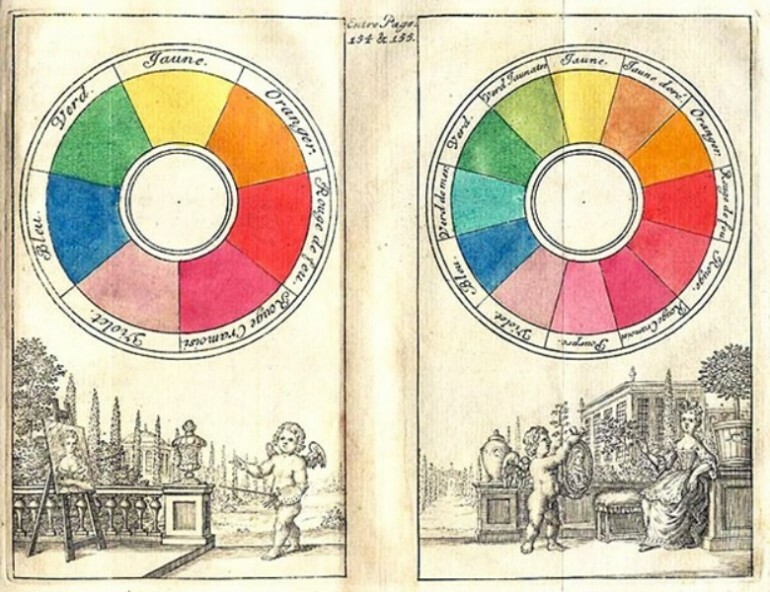 One hundred years after Sir Isaac Newton’s invention, Johann Wolfgang Goethe began to study the colors’ psychological effects. He learned that blue exudes a cool feeling while yellow gives off a feeling of warmth. He later created a color wheel of his own that showed each color’s psychological effect. He divided his color wheel into two: a plus side with red through orange all the way to yellow and a minus side whose colors range from green to violet to blue. Feelings of cheerfulness and excitement were given off by the colors on the plus side while the minus side produced feelings of unsettlement and weakness. Goethe’s fascination with Newton’s color theory led him to further experimentation and the publication of the Theory of Colors in 1810. In a basic color wheel, the primary colors are arranged in a way that they are placed across their opposite color. For example, blue and yellow are opposite colors. Between them are all the colors created when they overlap (additive mixing), arranged based on wavelength, and called spectral colors. The basic color wheel can show the three primary colors, then the secondary colors created by mixing two of the primary colors and the tertiary colors, which are products of the mixture of primary and secondary colors. Color harmonies are created from the color wheel. Complementary colors use colors that are directly opposite each other, such as red and green or yellow and blue. An analogous color scheme uses colors that are next to each other on the color wheel. More color combinations using the color wheel as the basis to create several other color schemes. On the other hand, addition of white to a pure color creates tints, while adding black creates shades. Tones are created when gray is added to a pure color.